How rad would it be to go on a Day of the Dead Vacation in Mexico? Day of the Dead, or Dia de Los Muertos, has influenced pop culture for decades. We’ve seen the iconic sugar skull on everything from tattoos to kitchen towels. It has even made its way into pop film (as we saw two years ago with The Book of Life and the soon to be released new Pixar animated film, Coco). There’s something incredibly appealing about the bright and beautiful artwork that comes from this traditional Mexican holiday which makes it so marketable. And giving credit where it’s due, having spent the last three years doing work in Mexico, I’ve found it’s a home to a culture which breeds fine craftsmen and artists of many mediums. But it’s not just the famed sugar skull which makes this holiday so appealing, it’s the festival itself. Known by locals in Mexico as “The Festival of the Dead” it’s a celebration of life for those we love who have passed on. Traditionally, family members will create an altar in the cemetery where their loved one was laid to rest. They will prepare the favorite meals of the deceased, play their favorite music and decorate a dedicated altar with special items of significant meaning. It’s believed that on November 1st and 2nd that the dead are able to dance among the living and celebrate with their favorite things. You can imagine this is a very personal celebration. To experience this as a tourist, you must know a family who is celebrating or you catch a local parade. So how can you go on a Day of the Dead vacation if you don’t have an in? The Xcaret Day of the Dead (or the Festival of Life and Death as they call it) is a popular event among Mexican nationals. It honors the Day of the Dead and was even declared a Masterpiece of the Oral and Intangible Heritage of Humanity by UNESCO, for celebrating the Festival of Life and Death Traditions every year on October 30th and 31st and on November 1st and 2nd. Xcaret Park celebrates both the new and old traditions such as the Hanal Pixan ritual (food for the souls), cuisine of the region, workshops, crafts, gifts and altars, visual arts exhibitions, theater, dance and gala concerts. This four-day event will take you through every aspect of the tradition without you needed an insider or intruding on personal traditions. And when combined with an incredible hotel like the all-inclusive Grand Velas, your Day of the Dead vacation can be both relaxing and cultured. These were taken by myself and my good friend / photographer Madison Greer. We spent 5 days at the Xcaret Day of the Dead Festival to experience it first hand. I can honestly say, it was one of the most incredible experiences of my life. A real bucket list one for me (and Madison too). The amount of work dedicated to the arts for this festival was mind blowing. It is truly a cultural and creative masterpiece of an event. 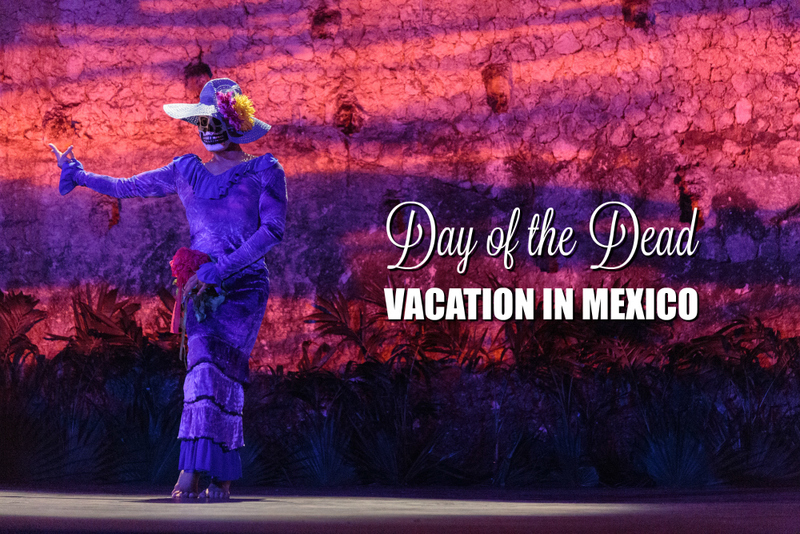 A Day of the Dead vacation to Xcaret would include performances both day and night, ancient Mayan ceremonies, face painting, evening walks through the traditional Mexican cemetery, cultural experiences / food and a showcase of traditional Mexican altars. Just have a look and see for yourself. Scroll to the bottom for the travel guide. Making chocolate from Cocoa beans… the hard way. As if a Day of the Dead Vacation in Mexico at Xcaret Park isn’t epic enough, a stay at the Grand Velas Resort will most certainly top off your adventure. Grand Velas is in my top 5 hotels and resorts of all time. This luxury all-inclusive resort in the Riviera Maya is a perfect place to spend your days leading up to the big event at Xcaret. It sits on the Caribbean Sea with a backdrop of the Yucatán Jungle and only a few minutes from downtown Playa del Carmen and Xcaret. With eight restaurants that feature acclaimed chefs from around the world, including Spain,Italy, France and Mexico, there’s something for every taste. Large spacious rooms with jetted hot tubs and private patios offer a comfortable space as well. And let me just tell you, the infinity pools and swim up bars are not hurting anyone’s feelings either. Madison and I had to get the specialty mojitos at the swim up bar. YUM. Travel Tip #1 – You don’t need a car, yay! You can hire a shuttle to your hotel for around $50 (for the whole group). That’s $100 roundtrip. Once you’re at your hotel, Xcaret can pick you up for your experience. Learn more about this on their site. Travel Tip #2 – You can do the stress free / uber relax vacation with Grand Velas (it’s in my top 5 best places to stay in the world. It’s all inclusive and had some of the best food I’ve ever eaten in a hotel). Travel Tip #3 – Make sure you have space in your luggage for shopping. You will find and buy some of the coolest, handmade items at the Xcaret Day of the Dead festival. Travel Tip #4 – It’s still pretty hot and humid this time of year in the Riviera Maya. Be sure to pack accordingly. Plan to wear your bathing suit under your clothes (to the park) and bring sunscreen. My Day of the Dead vacation with Xcaret was one of the most memorable experiences of all my travels. Everything from the hotel to the Xcaret Day of the Dead Festival was amazing. I can’t urge you enough, if you like the whole Day of the Dead artwork and holiday, experiencing this is an absolute must. Love the photos, Christa – especially those of the face-painting. I’ll be in Mexico City for Day of the Dead this year, and can’t wait! Thank you! Between Madison and I, I think we were able to cover a lot. Can’t wait for this year!